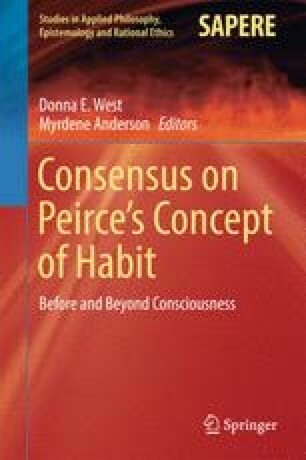 In order to study the notion of habit as an instance of Thirdness in Peirce’s work, it is necessary to go back to the intuitions at the basis of Peirce’s categories, trying to spell out concretely, as I think this has not been done before, the meaning of the three categories. This involves entangling the notions of fallibilism and of the collaborative work of the community of scholars, which may not have been taken seriously by most scholars pursuing the Peircean tradition. It is suggested that Peirce’s phenomenology is a version of Husserl’s phenomenology imposing a lot of constraints on the variation in imagination. In order to make sense of habit as Thirdness, we have to extend Peircean phenomenology into Husserlean phenomenology, abandoning the language of degeneracy, which is not very enlightening. Important contributions to the study of habit has also been made by several sociologists and psychologists. Ransdell, Joseph. 1989. Peirce est-il un phénoménologue? Ètudes Phénoménologiques 9–10, 51 75. http://www.cspeirce.com/menu/library/aboutcsp/ransdell/phenom.htm.